Not too long ago a majority of the dogs I knew were outside dogs. They lived their lives outside, performing some duty or job for their family – guarding livestock or protecting the family or house. Their lives were more adjacent to ours, still there but less incorporated in our day to day. However, with this increased integration, dogs are required to follow more strict rules and adhere to a great many of our strange human rituals. They’re required to become more tolerant and accept scary situations like vacuums, babies, music, etc. And failure to do so results in punishment to the dog. A common thing I see in my dog training clients is that we tend to ask either too much or expect too much from our canine companions. We fail to take the appropriate time to make them comfortable with a new experience or request and we see their animal instincts surface. Let’s look at an example of this with resource guarding and figure out what we can do to make ours and our dog’s lives easier! Our first example comes from a facebook post where a small child is reaching for something on the stove. The idea is, in this photo, we see a child unknowingly reaching for something they don’t understand can and will hurt them. Not all parts of the stove are dangerous but eventually they will find the part that is. So what happens after this? Do you get rid of the stove because it’s dangerous? Do you blame the stove for hurting your child? Do you remove the child from the area? Most people blame themselves. The stove was just being a stove – doing what it does naturally. They say they should have paid more attention. They shouldn’t have let the child have access to the stove. Unlike the stove, we expect the dog eating here to tolerate being grabbed and pulled on while eating. We expect the dog to tolerate being leaned over and having a human this close to his face while eating. If the dog does not. We blame the dog. The dog should have known she didn’t mean to hurt him, she was just playing. The dog should have just moved away if he didn’t like the attention. The dog should understand she doesn’t actually want this food. The dog. The dog. The dog. The thing is, guarding food is a totally normal behavior for dog. It makes evolutionary sense. If an animal just gave up his food to everyone else, he’d starve. He needs to protect it and keep it safe. This is how dogs are programmed to work. We, as their caregivers have to teach them an alternative behavior if we want this natural instinct to change and even if we do change it, we still must be aware it’s still there under the surface. “Resource Guarding” is when a dog guards or protects something valuable to them. It doesn’t have to actually be valuable (monetarily) or even something valuable to you. It can be a sock, a toy, a bone, tablescrap, etc. Anything they themselves find valuable. When this resource is attempted to be taken from them, the react with a behavior to ensure they get to keep it. The type of behavior they reactive with tends to be whatever has worked for them in the past. If a growl will keep the person away, they’ll growl. If a growl is ignored, and they lost the item, maybe next time they’ll snap, see if that works. Their goal is never to hurt you or be mean. They aren’t aggressive. They’re only trying to accomplish their goal: keeping the object. Teaching an alternative behavior for me comes in two ways. One, as food is the most likely resource to be guarded, I like to teach food avoidance. If food is dropped, I want their default behavior to be to move away from it. Two, if they take something I don’t want them to have or something that is dangerous, I want them to drop it. Upon request, I want them to readily (and happily) give the item back to me. If you’d like to attempt either of the above, I’d recommend you seek out a positive trained professional to show you the ropes. Going too fast or using punishment, actually tends to increase the chance of a dog resource guarding. A trained professional will teach you how to get your dog to enjoy giving you things and how avoiding say a dropped pill or poisonous food item, is fun for them. One other caveat I’d like to mention is dogs tend to be learn behaviors based on their situation. If you only practice food avoidance in the kitchen, then drop a hot dog in the livingroom, they’re likely to forget most of the training in the kitchen and be celebrating with a new found hotdog. That’s why, no matter what your teaching your pet it’s important to do so in as many different situations as possible until they start to generalize the behavior to other scenarios. Each new scenario, you’ll see some regression (wait, what did “leave it” mean again?) then faster learning as they pull from previous experiences (oh yeah, that thing we did in the kitchen where I move away from food). But My Dog Won’t Take Treats! I’ve seen the above statement used and said frequently by my dog clients (and defenders of “balanced” dog training – see my post about “balanced” training here). They have a dog or are working with a dog who actively refuses to eat whatever treats you are providing to them as reward for doing the desired behavior. Let’s look at some of the reasons why that might be. First, let’s back up a bit and look at why we positive trainers typically use food in the first place. Simply put: All creatures need to eat food. As responsible owners of our dogs it’s our duty to provide food to our canine partners. Food is therefore a desired resource and we fulfill this need of our dog making us too a valuable resource. Once dogs learn that good behavior gets them rewarded, they will repeat the good behavior more frequently in the hopes it too will bring about rewards! Basic learning theory. Some people incorrectly assume dogs should be “loyal” and do what we ask simply because we asked it. But that’s not how this works. In human terms you can think of this like getting paid for your job. As a kid, when you were learning things, you might have earned a gold star for doing chores or acing a homework assignment. As an adult, you go to work daily and eventually get a nice fat paycheck for your efforts. So even we don’t “work” for free (even volunteer work provides us with rewards). But eventually we get some reward. It’s no longer instant, like it was as a child while we were learning those chores but it is still there. If you suddenly got less of a paycheck or no paycheck, you’d easily become frustrated and eventually stop working because your reward has stopped. No rewards. No work. Same applies with all creatures. 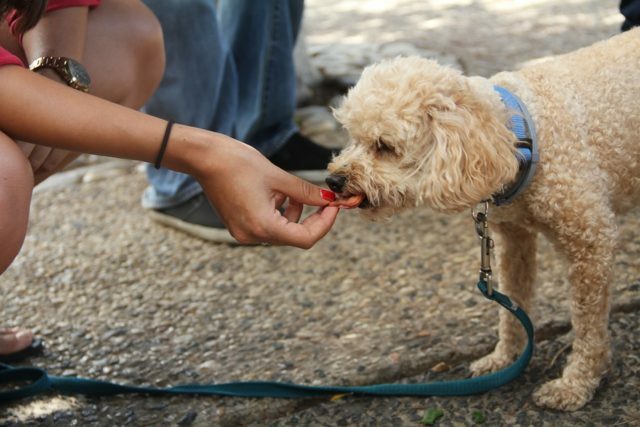 For dogs, there are some that refuse food while your training. Instead of being frustrated this can be a great signal to you that what your asking is too difficult for your dog and you need to make it easier (most common) or the reward isn’t valuable enough for them considering the challenge you’re asking. Let’s look at a dog example of my own clients dog refusing treats during training. We were working on doing a desensitization sessions with a client and her dog Bear (name changed). Bear was a reactive Doberman who was terrified of dogs on the walk and would react when she saw them by barking/lunging at them on leash. During one of our first session, I was using my common treat bag on a mix of dog kibble, dried chicken bits and salmon. We were playing the “Look at That” game and as she looked at a dog, we’d mark that behavior with a click from our clicker and she’d get a reward of food. Our first round of this, she took the treat and spat it out. Why? First thing we should look at is the situation. Here the demo dog was about 50 feet away and walking by sideways staring at Bear. Maybe this distance was too close to her and she was simply too nervous to eat. Maybe Bear was uncomfortable by the dogs stare. A human analogy of this would be if you were put in a the middle of a group of mean looking people armed with guns. I’d approach and offer you $100 bucks. You might take it, you might not. But your focus/priorities are centered around safety, not monetary rewards. The situation is too overwhelming for you to be considered about money. The other issue was maybe the reward wasn’t highly valued enough for the challenge Bear was facing. Using something like cheese or freshly cooked chicken might result in her focus changing and her being able to eat the treat. You can think of it as the “payment” not being high enough for the work being asked. Imagine you were asked to empty a trailer of boxes into a storage unit. It takes you 5 hours, and you are hot, sweaty and tired. They give you $10 for your efforts. Then ask you to come by next weekend do to the same. In this case, I asked us to move back a bit. Give her more distance so she’d feel comfortable in taking treats again. She did and her next “Look AT That” got her some yummy cheese! In my near 12+ years of working with dogs, I’ve never met a dog who didn’t like food. Never. Some also are motivated by other things like toys or tug or a scratch in that good spot, but none have ever not wanted food. Even after they’ve just eaten dinner. 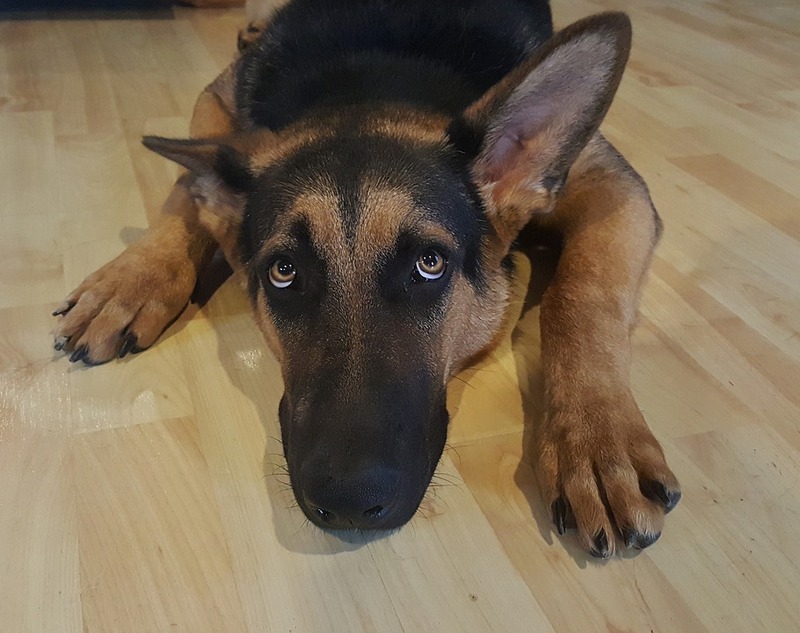 If your dog ever refused treats, its a good time for you to take a step back and see what might actually be going on that is causing your dog to be overwhelmed and alleviate that overwhelmedness. As many of you already know, I currently have three rescued dogs, Luna, Esther and Prim. Despite having an already full household, with the addition of three cats (Cass, Inara and Selina), I still find myself browsing through petfinder at the hundreds of dogs (and cats) currently still looking for their forever home. It’s sad to think about the number of pets who sit her waiting for months and even years before finding a home and family to call their own. Even sadder are the pets who wait forever and never find their own family. A lot of times the ones most often overlooked are the elderly or the sick. People want that cute little puppy. And I think a common misnomer to one of the reasons people are still hesitant to adopt is they’re worried about “adopting” someone else’s issues. A lot of people assume that dogs in shelters or foster homes have been given up because there is something wrong with them. I think this fear of adopting a dog “with problems” from a shelter, leads a lot of potential families to looking at breeders. They want a puppy whom they can “raise right” and who comes to them as a “blank” slate. But is any of this true? Is getting a puppy from a breeder a better route than adopting another dog (of any age) from a shelter? There as an interesting dog study that was done that looked at this a similar question – which you can check out here. To be honest, I’ve often wondered the same thing. As a dog trainer, I know a lot of the right ways to train a pup and I’ve seen a startling contrast between how I raised my first TLC dog Rufus and how I’ve raised my second TLC dog Esther. Rufus was adopted at age 7 and Esther was adopted at 6 months. Rufus was raised by a loving dog owner who had read some books and thought she knew things sometimes. Esther was raised by a certified dog trainer who knew all about the benefits of positive reinforcement and force free training. I’ve found myself wondering as of late, as puppies go through such critical stages of development between 8 and 16 weeks old, would getting my next dog at this young of age, produce a better household pet? At this young of age, they’re essentially blank slates right? Ready for you to imprint all your knowledge on to right? Turns out what the study found was a kin to the whole nature vs nurture question. In this study they took two mom dogs each with a litter and switched the litters. One mom was extremely nervous and another mom was very friendly and confident. So switch their liters and the idea was these blank slate puppies would take on the traits their new mom showed them right? Turns out not so much. The puppies from the fearful mom, remained fearful even with their new momma showing them all the ropes about life and how exciting it could be. The puppies from the confident mom suddenly became fearful as well without the guidance of a confident mom to show them the ropes. Two moms of opposite ends of the spectrum, yet both ended up with puppies leaning towards the fearful side. The authors proposed a kind of spectrum of fearfulness and how that potential was influenced both by environment and genetics. Take for instance this graph from the study above, about one of the fearful puppies who was given to the bold momma. Here were her end results. Her genes from her fearful parents gave her a genetic potential leaning towards the fearful spectrum of thing but the influence of the bold mom (environment) placed her towards the bold end of her potential. Yet the end result was she still leaned towards being on the fearful side of things. While these traits are not set in stone and can fluctuate a bit throughout a dogs life, this dog will likely never be the kind of dog who runs up to a stranger and becomes instantly friends. In Esther, she came into the shelter at only 8 weeks old, and was immediately surrounded by various volunteers and dogs and experiences. When I adopted her a few months later, and began training her you could definitely see her potential blossom. Now it’s like having a conversation with an infant. “Can you please get down?” or “Hop on up” results in her actively doing those things instead of staring blankly with a wagging tail like Rufus 😉 However her limited exposure to men growing up in a predominately female run shelter has led her to be fearful of new guys from day one – something we are constantly working on improving even to this day (she’s 7 now). In Luna, she came to me a feral who would literally scream if you startled her or tried to pet her those first few weeks. She’d panic if she saw a person walking 75 feet away. Now, nearly two years later, we can pass a person walking or running on the sidewalk from about 6 feet away. We can walk in a park and have dogs and people pass us. But it has taken us TWO years to get to this state. All because her environment and genetics predisposed her towards being fearful of new (and scary!) things. We’re working against that predisposition. Is it possible? Clearly yes. Is it easy? Definitely no. The conclusion after looking both at my own dogs and reading the study above is that you’re never going to know with absolute certain what type of dog you’re going to get. The older dogs, even the 1-2 year olds, have a lot of their genetic traits out in the open. They’re going to present themselves as they are. Fearful dogs will be fearful and bolder dogs will be bolder. With puppies, who are still actively being influenced by their genes these traits are harder to determine and can often manifest as the puppy ages and matures. To me, I firmly believe, you don’t always get the dog that you want, but you get a dog that will help you grow. Rufus, despite not being an A+ student, I learned all about unconditional love from a dog whose only request in life was to be WITH you. From Esther, I’ve learned to appreciate her endless enthusiasm for life and it’s experiences. From Prim, who’s deaf and blind, I’ve learned a great deal of patience and gentle ways to approach and interact with a critter who’s world consists only of touch and scent. From Luna, I’ve learned to appreciate the small steps of progress and forget about the “somedays” and “maybes” and focus on the now. All dogs change us, no matter where they come from. And all will present challenges and hurdles throughout their lives. Love them. Train them. And love them some more. We’re going to take a break from doggios for this week and look at a brumby stallion. What? Have I gone crazy? What the heck is a Brumby? Well read on! A Brumby stallion is a term in Australia for a wild or feral un-neutered male horse. In Australia these wild, roaming horses are considered pests as they destroy and eat the native ecosystem. The government of Australia has been struggling to determine what to do about all these feral horses having performed mass cullings semi-recently to reduce population. They have also attempted a few times to move larger herds with some sterilization to other areas less intrusive areas but without much success. Organizations like the The Guy Fawkes Heritage Horse Association are stepping up in order to rehome and relocate these horses in the hopes that mass cullings like the one from 2000 will never be needed again. However, as you can imagine, few people want to take on the challenge of adopting a wild, feral horse – let alone a stallion. They can be dangerous when frightened or scared and their size greatly out-masses their human caretakers. As you see in the dog training community, the horse training community too struggles with adoption of modern methods. Old time training methods or “traditional” methods includes “breaking” a horse using aversive (painful) methods and tools to “break” the spirit of a horse and force them to obey their new human owners. The goal of the aversive training was to get the wild “rebellious” nature of out a horse and transform them into an obedient, mild mannered domesticated horse. Just like with dog trainers,there are those horse trainers who remain in the dark ages using tools that inflict fear and pain to control the wild tendencies of these creatures and then there are those who have become educated in the ways of learning theory, behavioral study and positive training methods. A few weeks ago, I stumbled across a blog about a four year old wild, feral Brumby stallion named Lumos who was adopted & rescued by a young lady name Jaclyn. Jaclyn is a dog trainer by trade and runs the “The Dog Nose” dog training and behavior facility in Australia. She had always wanted to adopt a horse, instead of buying one, and was looking forward to earning this spunky Lumos’ trust throughout the coming months as she introduced him, using positive training methods, to the modern world. I’m always impressed with how quickly animals, of any species, respond to positive training methods. When we treat these magnificent creatures with respect they deserve, they in turn reflect that trust and respect back onto us. By listening and respecting their body language, we can show them that we will never ask them to do anything they are uncomfortable with and that if they work with us they will be rewarded for their efforts. By doing so, within just seven days, Mr. Lumos was happily eating right from Jaclyn’s hand. She had earned his trust and he understood that she meant him no harm. I will never hit you, whip you, kick you, force you, chase you, scare you, pull you or hurt you. Your body is your body, and you will always have a choice. You can say “yes,” and you can always say “no,” and I will always listen. like when you let me pat you, and ride you! If you are interested in following Lumos’ journey and see many of the wonderful positive, force free training methods Jaclyn uses to teach Lumos the skills he will need in the modern world, please give their facebook page a like: https://www.facebook.com/Lumosthegoldenbrumby/ and continue to be impressed with their amazing journey together. I know I sure am! Jaclyn with Lumos just over a month after being rescued. This past week we had three new arrivals to the Underdog’s Triumph family. We welcome the little standing husky, our politely sitting boston and our happy-go-lucky terrier. Why would a training center need some fake stuff dogs you might ask? Reactivity – that’s why! Reactivity is a term I use for dogs who are experience some intense emotion that causes them to react in what we would call an inappropriate manner. A reactive dog might lunge or bark, sometime they might nip or bite, some if pushed to far can even kill. Dogs who are reactive, lack the skills of knowing alternative behaviors when they get into this emotional state – which is typically cause by fear and sometime over excitement. The interesting thing is that dogs typically don’t start out reactive, they start with smaller, oftentimes overlooked behaviors like avoidance or lip licking (stress signals) and progress upward to these overt displays of behavior which are quickly noticed by other dogs, their owners and other people. And as I’ve written about before, dogs do what works. They don’t know right or wrong, they just repeat what was successful in the past or they try something new. If overt displays of a crazy dog at the end of the leash work to get what they want (most often the other dog/person to go away), then they’ll continue to do that next time. Quick note, if you have a reactive dog, I’d recommend getting professional help from an educated dog trainer. You can check out my blog posts here and here on how to find a good one. Reactivity training requires a keen sense of dog body language and observation on the owner’s part and is greatly aided by a force free professional helping them spot what their dog is trying to tell them. For dog to dog reactivity training, we would aim to teach the other dog an alternative behavior and then reward that alternative behavior more than what the dog would have gotten simply by lunging or barking at the other dog. But for those of you who have reactive dogs, have you ever tried to ask your dog to do any command while they are flipping out and bouncing all over at the end of the leash? It just doesn’t work. When the dogs get into that reactive state of mine, I always like to say their ears go closed and their brain turns off. They are in such an emotional state that they can’t even process that you’re trying to get them to do something else. So what’s the trick? The trick is to start working at a great enough distance before they get into the crazy flipping out stage. The part when they first notice the other dog or person and yet the dog/person is far enough away they don’t feel threatened. Then we have to practice those new techniques. Practice not only helps the human learn skills like how to hold a leash correctly, or how to recognize when their dog is in the beginning stages of becoming reactive, but it helps the dog as well. 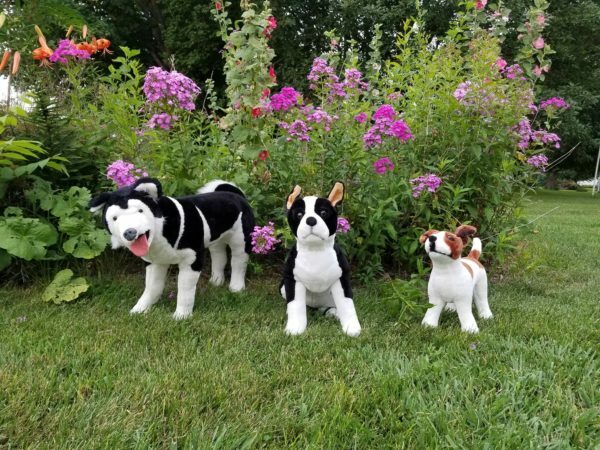 Using these fake stuffed dogs as practice offers the owners and their dogs the easiest possible scenario. These fake dogs don’t move, they don’t bark, they come free of an owner and yet they still look like a dog. With a stationary “dog” the owners and their dogs can practice different styles of scenarios, like walking up to a dog, walking around another dog, walking away from the dog, all the while knowing that if their dog were to get loose no one would be harm, and knowing the fake dog will always stay right where we left them. My own adopted dog Luna came as a feral dog (meaning she had never really been around other people). She started with a 75 foot required distance from the another person or she would flail and panic at the far end of the leash trying to get away from them. Yesterday, almost two years after I adopted her, she passed by a jogger with only a five foot distance between us and him. Reactivity training takes time, effort and consistency for the dog to begin to learn a new behavior when meeting a dog. It also takes a lot of patient and practice on the owners part as well. Overtime the dog (and the human) will start naturally falling back to these new behaviors and you’ll be able to get closer and closer to the other dog or person without having them react. If you need help with reactivity, feel free to reach out, we can help you work with your dog on reactivity training or we can help you find someone in your area qualified to do the same. Trust me though, these three little amigos are up to the challenge and look forward to helping many other dogs and their humans in the future! Program Updates & Happy 4th of July! Underdog’s Triumph will be switching it’s training articles to be the 1st and 3rd week of the month. We’re starting up some new educational programs with the local Boone Area Humane Society over this summer and we’re going to use the “time off” to work on developing out these programs. We hope to have these programs finalized soon so we can share them with all of you! 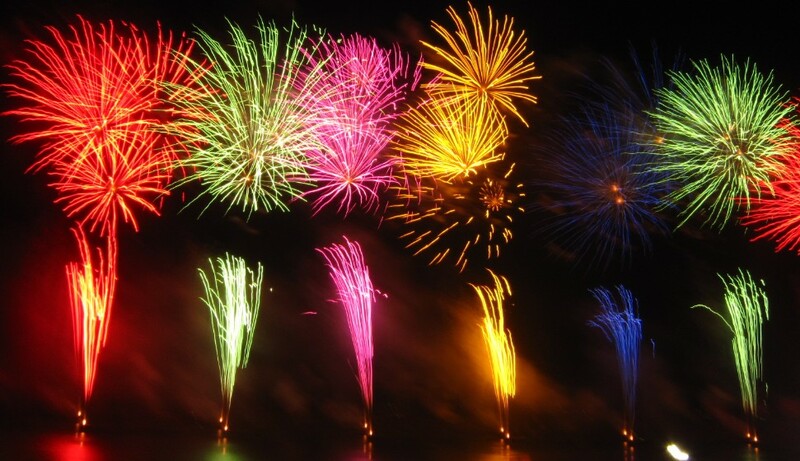 This includes both discarded fireworks refuse as well as the lighters used to set them off. Take a current photo of your pets in case they do get lost you have a recent photo that will look most like them. I also highly recommend the Canine Lullabies music for dogs. For whimpering puppies, sick or injured dogs, or even just hyperactive pets, it is a life saver. For more information go to www.caninelullabies.com. You can also stream these from Spotify using these links (https://open.spotify.com/album/720unplZaQChtc1bTf2sEe) and (https://open.spotify.com/album/0QXGxWJyMtWqVfSqZtJseH) for free with commercials or without commercials if you already pay for a Spotify account. This has been used at our sister shelter the TLC Canine Center in Newell, IA and it works great! I have also used this the last few years and while it doesn’t cure their fear it does help dramatically during periods of high stress. Stay Safe & Happy Holidays! At Underdog’s Triumph we believe in promoting (and using!) positive, force free dog training methods and tools. These tools are designed to help us work with our dogs and not against them. In the dog training lingo, we promote the use of LIMA – Least Intrusive, Minimally Aversive approach to modifying dog behavior. We advocate for giving the dog a choice and guiding him or her to the desired behavior. However there are many organizations that still do not follow these principles. The prevalence of a popular dog show, The Dog Whisperer, (which I have written about in the past here) has revitalized a generation of up and coming dog trainers to the belief that dominance, pack theory and other outdated-no-longer-relevant theories are truth. They watch this show, see the super quick change in behavior and, despite the warning at the beginning of the show, try it on their own dogs. Even worse are the trainers who determine, they are not only experts at training their own dogs, but other dogs as well. In a recent paper written by the European Society of Veterinary Clinical Ethology (found here and the summary of that paper by Companion Animal Psychology found here) they highlighted some of the risks and dangers associated with using shock collars on dogs. 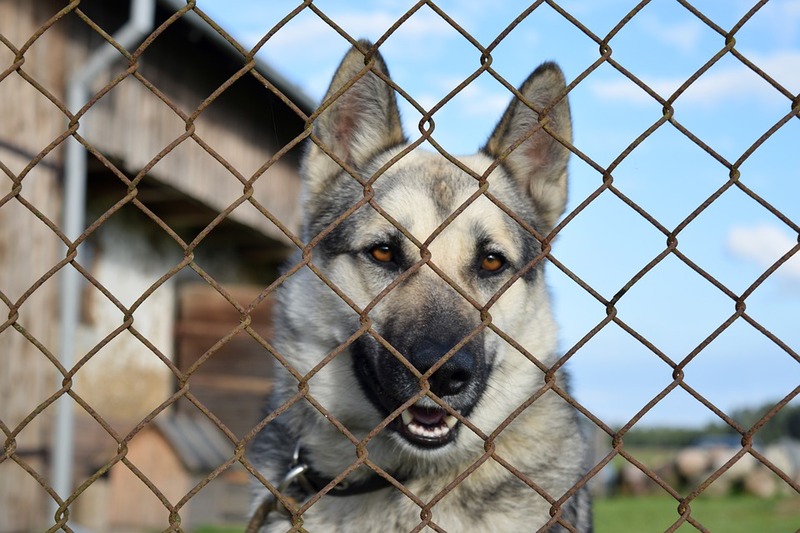 While the focus of their study was only on shock collars the same concerns they bring up in the article can be applied to any other positive punishment or in negative reinforcement situation. Keep in mind the “positive” and “negative” here do not equate to good or bad like people think but rather the “addition to” or “subtraction of” some stimulus. The second word punishment or reinforcement again doesn’t equate to good or bad, but rather the “decreasing” or “increasing”, respectively, the likelihood that behavior will happen in the future. For shock collars, positive punishment would be the shock being added after every incorrect behavior. Negative Reinforcement would be the shock being applied continuously until the dog performs the desired behavior and the shock is removed. Additionally, the efficacy of these collars has not been proven to be more effective than other alternatives such a positive training. Hence, ESVCE encourages educational programs which employ positive reinforcement methods (while avoiding positive punishment and negative reinforcement) thereby promoting positive dog welfare and a humane, ethical and moral approach to dog training at all times. So love your dog (and yourself) and choose a method that promotes a strong, healthy bond between you and your dog. In the past I have written about how to find a good dog trainer (see my past post here). First off, I LOVE it when my prospective clients ask me questions about my methods and techniques BEFORE agreeing to see me in person. I also truth be told, I do the same thing to them. At Underdog’s Triumph we start off all new clients with a consultation visit. This 1 to 1.5 hour visit includes a pre-questionnaire detailing what the client and their furry friend are experiencing and goes briefly into what they want to get from the training. Then that first session is almost entirely a question/answer and discussion session. So many people want to just jump right in. Start training on day one. But I firmly believe that every dog, must like every client, is different. It’s important to hear them out and make sure they are comfortable with the decisions you are making together for their family. While I have a boatload of questions I like to ask my prospective clients to learn all about their situation, experiences with dogs and training, there are also some great questions to ask me as your prospective trainer! You can read more about these questions and other questions from Victoria Stilwell’s article about “How to find a Good Dog Trainer” I picked out my top four favorites from the article to share my opinion on what would be a good response! Note: ALWAYS be prepared to walk away from training if the trainer EVER suggests something you are uncomfortable with doing. Just because they are an “expert” doesn’t make them 100% right all the time. Suggesting things that hurt the dog or cause you to feel uncomfortable doing is a perfectly acceptable reason to stop immediately. Remember YOU are your dogs voice so use it for the both of you! Manages unwanted behavior to prevent it from continuing to happen. Designs a training plan using reinforcement to increase the likelihood that the alternative behavior will be performed (and eventually replace the unwanted behavior). More Info: Oddly enough a lot of people who are against using only force free or positive training methods seem to think that these types of trainers (of which I am one) are pushovers when trying to stop unwanted behavior. Since we can’t “correct” the dog with a harsh jerk or some other additive of pain, the dog jumps/walks all over us right? What they don’t understand is the dog doesn’t mean to do the wrong thing. To the dog, jumping all over guests isn’t wrong. It’s fun! They are excited to see a new person and jumping expresses this excitement and gets them closer to the visiting guests hands and face for pets/licks. Ideal Response: ABSOLUTELY! Ideally providing you proof this liability in the form of a card or written document. More Info: A lot of trainers do not carry any kind of insurance and I don’t think that’s being responsible. For all the training and education we have, we’re still dealing with another living creature. We can do our best to predict what might happen in a training session, but we can’t predict everything and accidents can happen. Make sure your trainer has you both covered by having additional liability insurance to protect you both. More Info: A fantastic response should go on to talk about using different motivators inorder to find out what works for each dog. While almost all dogs are motivated by food (we all have to eat right?!) some also get a lot of enjoyment from toys or other creative things. My own dog, Luna for instance, LOVES blankets. Trainers should use these high value motivators and help you incorporate them into training. Life rewards are also great motivators – these are everyday things that dog enjoys. An example of a life reward might be having the dog sit by the door and after that sit, opening the door to let the dog out into the yard (aka granting access to a desired area). These types of rewards work great to incorporate into daily routines for daily activities. Ideal Response: Of course! And provide a list of potential options. More Info: I typically have ask past clients if they would be able to chat with new clients when requested. I like to pair past clients with potential clients based on the issue both dealt with. For example I did some new puppy socialization classes a while back, pairing up this client to a client with a fear aggressive dog would just be silly. The situations aren’t the same and the training for sure won’t be either. Apples to Apples works much better. There’s a new craze in dog training called board & train. Supposedly more convenient than the “old school” do-it-yourself dog training, board & train programs typically offer to take your dog for a certain number of weeks or months and train them for you. After a set upon time, you then pick up your newly trained, amazingly behaved dog and you’re set for life! Seems to good to be true, right? The first issue I have with many of the standard board & train programs is, as I wrote about in my previous article (here), dog training is like 5% teaching the dog and 95% teaching the human. Board & Training programs do this in reverse. They teach your dog a specific set of skills in THEIR board & train facility then hand the reins back to a novice, untrained owner who takes the dog back into THEIR old house. If you recall, dogs are TERRIBLE at generalizing behaviors – one of the reasons you as their teacher have to proof their behaviors by training them in so many different environments and situations. Plus they go back to their old environment, so it’s so easy to fall back into old habits and routines. There was actually an interesting trend (written about in Risë VanFleet in her book The Human Half of Dog Training) that dogs put into this situation typically get worse overtime. Humans too suffer from this same issue. The behaviors we didn’t want from our dogs (aka the reason we sent them to the board & train program in the first place) are improved, so we relax our rules. We start to let things slide. We fall back to our old routines, because they’re easy, familiar, and comfortable. We stop (or at least slack) some of the things the board & train trainer told us to always do. And shortly after we slack, our dogs fall back to what is familiar (and likely unwanted) behavior. Secondly, you have 100% NO control over what methods the trainers use nor any control over which trainers do the training. Is the trainer a 20+ year old dog training “pro” who hasn’t read a modern dog training book in the last two decades? Or is it the kennel tech who’s fresh out of high school with aspiring dreams of being the next world famous dog trainer? I’m not saying you can’t have a good experience with either of these two hypotheticals, but the point of the matter is you simply don’t know who’s doing what. Is your slightly timid or reactive dog having their symptoms masked using punishment instead of having the proper counter conditioning program setup and completed? Is an incorrect application of a punishment going to trigger a new fear in your dog? You won’t know because you aren’t there to be their voice! Case in point, a recent news story about 41 dogs who were rescued from a kennel in Hancock, Iowa supposedly doing board & train for gun dogs. Three dogs were also found deceased with their owners having never been notified. Many others supposedly being trained at the facility shipped in from all areas of the country are still missing. There fate remains unknown. Of the dogs who were rescued, their kennels were completely lacking any food or water. The build up of feces in the kennels proved they’d been living in these poor conditions for some time. On top of all these issues, these programs cost thousands of dollars. Even Young Gunz Kennel charges $550 per month for a facility that can’t even provide the basics of food, water and clean shelter to the dogs in their care. Dog training should be a team effort between canine and human(s). It should build the trust and bond between the two species using safe, positive, force free, scientific methods. Having the training done by someone else without your consent or knowledge is a recipe for disaster. Take the time. Make it fun. And enjoy the opportunity you have to bond with your canine friend! Let’s talk a bit about while these two situations are similar, they are also very different. Let’s start with the easier of the two: training. Training is teaching the dog a new behavior and pairing this new behavior with a word or hand signal so you can cue it on demand. You might want to have your dog learn how to sit, or stand, or hold his paw out so you can trim his nail. These are all behaviors we can easily get your dog to perform. What makes it a behavioral issue is when your dog has some strong emotion tied to the behavior you are trying to change. Aka the dog jumps on people because they are extreme scared of them not because he likes jumping. With behavioral issues, common training behaviors become symptoms of an underlying emotional cause. When the human component fails to realize this, it’s easy to try and treat just the symptoms, train alternative behaviors. Aka teach the dog to keep four paws on the floor. However, the emotions behind why the dog was jumping are still there. S/he is still feeling scared and unsure they just can’t jump to express those emotions any more. This leads me to a reminder about corrective or punishment based training tools like prong, choke or shock. These tools work by punishing the unwanted behavior. They do nothing to teach the dog what to do only what not to do (and trust me the “not to do” list is wayyyyy longer). When you use corrective tools studies have shown (see last weeks article) the dog tends to learn slower and require more repeated punishments or increase in the strength of those punishments to be effective. Dogs who have been training using these methods have a higher amount of stress hormones and show more stress signals during training sessions and when these devices are used. Interestingly, there was a study done that showed these devices can leave a lasting impact on the dog. A dog was trained using punishment based tools in a specific room. Then three months later brought back to that room. Upon entering, they saw an immediate increase in those same stress hormones despite no punishment being used. Three months later and the dog still remembers that fear and stress. In training issues, when you use punishment you will start to see a dog that shutsdown. Because you punish a majority of their actions, these dogs become less sure & less willing to act for fear of being punished. Dogs trained using these methods are more likely to develop behavioral issues, especially when used by inexperienced clients, due to poor timing, unclear criteria for what gets punished, and the use of too many or too harsh of punishments. And it’s not just the dog who suffers from these methods. The human component easily gets frustrated by the lack of progress and it creates an adversarial relationship between human and canine. Punishment based “training” has no place in addressing either training or behavioral issues. They tend to make issues worse (especially in the hands of novice trainers) and damage the relationship between you and your dog. I want a happy, fear free dog who’s eager to please and who works with me everyday. Force free, positive training methods get me there!